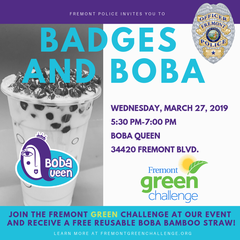 Please join us for Badges and Boba on Wednesday, March 27, 2019 from 5:30 - 7:00 p.m. at Queen Boba. 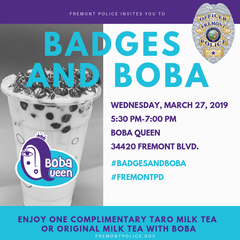 Please join Police Chief Kimberly Petersen and members of our department for boba tea in an informal and friendly setting on March 27. Patrol and traffic officers, detectives and our Public Affairs Specialists in our Community Engagement Unit, will be on hand to answer questions, discuss neighborhood concerns or just get acquainted. No formal presentation is planned, so feel free to drop by anytime during the free event. Location: Queen Boba – 34420 Fremont Blvd. Complimentary sample size Taro milk tea or Original milk tea with boba will be provided while supplies last. Please contact the Fremont Police Department's Community Engagement Unit at 510-790-6740 or Mleon@fremont.gov if you have any questions.